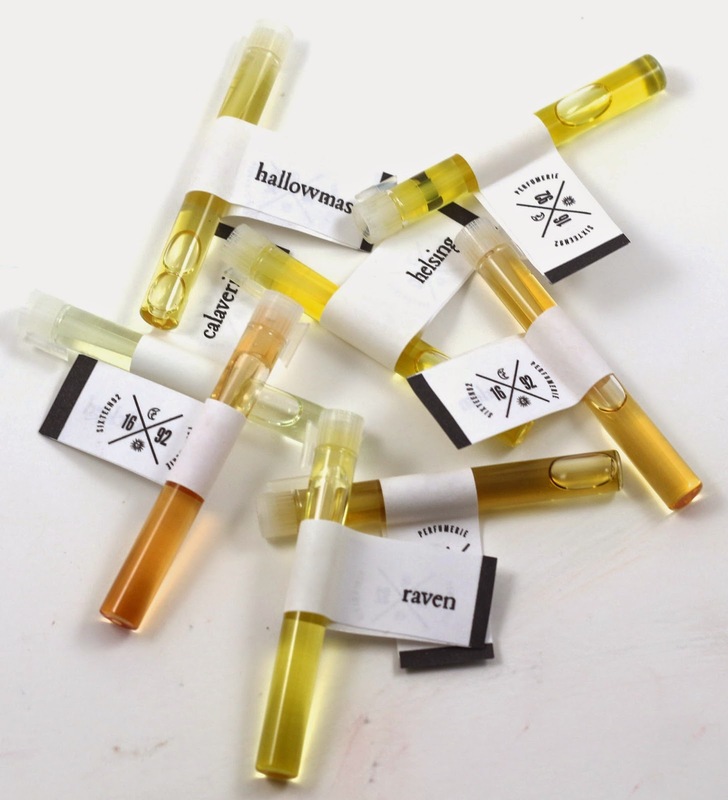 I had heard rumblings about this very new indie perfume company, Sixteen92, and I had a chance to smell some of their perfumes and I knew I wanted to buy some. They were so unique and interesting, and nothing like the other indie perfumes I had tried. Intriguing how all the indie perfumeries seem to do that, make theirs nothing like everyone else's. So I decided to get their Fall Collection Sample Pack, and see for myself how some of the special fall scents would work for me. Sixteen92 currently only has an Etsy store open, but they are working on their regular website. I have to say, their website design is impeccable, I love the style and design, that and their packaging is very well thought out and planned. Here's the description of their store, it's a perfect description so I will let it speak for itself: "Alchemy. Science. Magic. In the seventeenth century we would be outcasts, sorceresses, witches. Today, we are olfactory artisans, authors and curators of the tiny works of aromatic art that you carry on your skin. Sixteen92 is a conceptual fragrance house that crafts small-batch perfume blends inspired by literature, history, lore...and, yes, a little bit of magic." I ordered the Fall Collection Pack, and it was shipped after 4 days via USPS from Texas to California, it then arrived in 3 days. Even the business card included with my order was beautifully designed, simplistic, and quite striking. I'd be willing to bet she has some sort of design background. Here are their sample vials, they are 2ml, instead of the normal 1ml vials most companies have for samples, which can be both a good and bad thing. Good if you like the scent, bad if you don't and bad on your wallet. These samples are more expensive than most perfume samples you can get from some of the other indies, and while I value their uniqueness, I think I would prefer the 1ml size vials for samples. Because these will now be a pain to store, as I have storage that will fit the smaller vials, and if I don't like a scent, I now have double the amount I usually would, and I paid more for it. Also, there were no free samples included, from what I've gathered, she occasionally includes a sample, but it's random and only in a few batches of orders. Seems a little unfair to me, I'm fine with an indie company offering samples for everyone, or not offering samples to anyone, but to only give them out for some orders? I would even be fine with it if you only got a free sample with orders over a certain dollar amount, but it just seems to be random. Calaverita - "Pan de muerto sweetened with cinnamon sugar, Calaveras (sugar skull candies), crisp November air, and an ofrenda of sweet incense and candles to honor los difuntos." Out of the bottle, this reminds me of Dia de los Muertos, even though I'm not Mexican, and I've never celebrated Day of the Dead. Pretty cool how scents can transport you somewhere you've never actually been. I love the scent of this, it smells wonderful, but I have some bad news. I put this on, and immediately my wrists had an allergic reaction to it! I was so sad! They turned all red and kind of swollen, so I immediately washed it off several times, and within a few hours the reaction went away. But I will have to do some research to see if I can find what ingredient was the culprit. But the scent is so wonderful, I'm going to turn it into some wax tarts so I can still enjoy it. It could have been the cinnamon because that can be a skin irritant, but I've used other things with cinnamon in it and I haven't had a problem. I just don't know, I've never had an allergic reaction to anything, so it was kind of surprising for me. Unfortunately, because of this, I don't know what the smell dries down to. Hallowmas - "Fossilized amber resin, spiced Bosc pear, red apple, black musk, heliotrope." This smells like the outdoors, it's blended so perfectly you can barely pick out the individual scents, but I think I can smell a little of the amber and black musk. It reminds me of the smell of a cool autumn day, if you went hiking through the redwoods after it rained and there is a sea of ferns surrounding you. It also smells a little sweet, a little feminine, I really like this one. It doesn't seem to last very long, but that seems to be the case with most of these perfumes from the Fall collection. After a little while it starts to smell a little metallic, but it's not a bad thing. Helsing - "Smoky Lapsang Souchong tea, dragon's blood, cedar wood, fir balsam, leather, saffron, chai spice accord." I can smell a little bit of each note in this, but when it all comes together, I'm not quite sure what I'm smelling. It smells a bit manly, and I can definitely pick out the cedar and fir mostly. I can't help but feel as if there were too many fragrance notes added to this perfume, sometimes less is more. But it doesn't have a strong silage, and like most of the other perfumes in this collection, it doesn't last long. The more it dries down though, the more I can pick out the smoky tea. It's interesting to say the least, at the very least a good winter unisex perfume, but leaning a little more towards the male scent side of the spectrum. It almost reminds me of B's beard oil he uses, except without the citrus notes it has. Huntsman - "Cardamom and vanilla infused coffee, fossilized amber, Agarwood (oud), tilled soil." Out of the vial this smelled very interesting to me. Then I wore it for a few hours, and thought it smelled like cedar or something similar. I read the scent notes again, and realized I was smelling pure cardamom. And boy, did my skin amp that scent! I'm sad, I would have liked more of the other notes to come through, but nada, just cardamom. Strong too. So, this fragrance may not be for me. What a bummer. Raven - "Spiced apple, tea leaves, tobacco, guaiac wood." This reminds me of something I've smelled before, but I'm not sure what it is. Possibly something Bath and Body Works sells, and it's a little "too something" for my nose. I guess it's the apple, but it doesn't smell spiced, it smells a little fresh, and there's a little of the tea in there, but I don't smell the rest. I don't know if I could wear this by itself it feels like a scent that would give me headaches, but maybe mixed with something else it would be better. Not a fan. Salem - "Damp leaves, church incense, worn leather, dry birch woods, clove bud absolute, bonfire smoke." Oh my, this is beautiful! Without reading the notes, I couldn't tell you what was in this, but it smelled kind of fresh, a little mysterious, and a little witchy. After reading them again, I can smell the damp leaves, the leather is very subtle, and the smoke makes an appearance at the end. It's very lovely, and not strong either, so you can kind of slather it on. After wearing for a few hours, it started turning a little sweet and vanilla-y on me. Just beautiful, I might have to buy this in a full size. And B liked it too, so win! Vespertine - "Aged, double-distilled patchouli, precious mitti attar in sandalwood oil, white thyme, frankincense, rich black myrrh, long-dried rose petals, cannabis flower." I made a face when I first smelled this on, it's a little overpowering. I don't think this will work at all, it smells like you put all the notes in a cauldron and lit them on fire, and this was the resulting smell. I don't like it. It's worse than Huntsman I think, though I have a friend who is super into patchouli who might like this, but it smells burnt to me. Burnt and smoky. I'm going to just wash this off immediately, ugh. Wicked - "Three vanillas, aged patchouli, marzipan buttercream." Out of the bottle, I really only smell the marzipan, but once it's on the skin I can start to smell the vanilla and the patchouli. The patchouli really starts to come through after a minute or so, and I think the fact that it's been aged gives it a more complex and balanced note. I don't really smell the marzipan at all on the skin, and even the vanilla kind of disappears. It's also not very strong, so it's nice for those who like a very subtle perfume. Overall, this collection was totally hit or miss for me. I was really excited about it after I had smelled a few of the regular collection scents, but the fall scents weren't as well put together I don't think. Although I won't be able to say so for sure until I get a chance to review them. I think Salem is the only one I really loved and would consider getting in full size, but I also enjoyed Hallowmas and Wicked quite a bit as well. But Calaverita will need to be turned into a wax tart since I had a reaction to it, and Huntsman and Vespertine will probably never be used again. I don't even know if I could find another use for them. But even though I was pretty disappointed in a few of these, I'm still probably going to buy a few from the regular collection. I will definitely be picking them more carefully though, and I probably won't buy another seasonal collection without waiting for some reviews on them first. 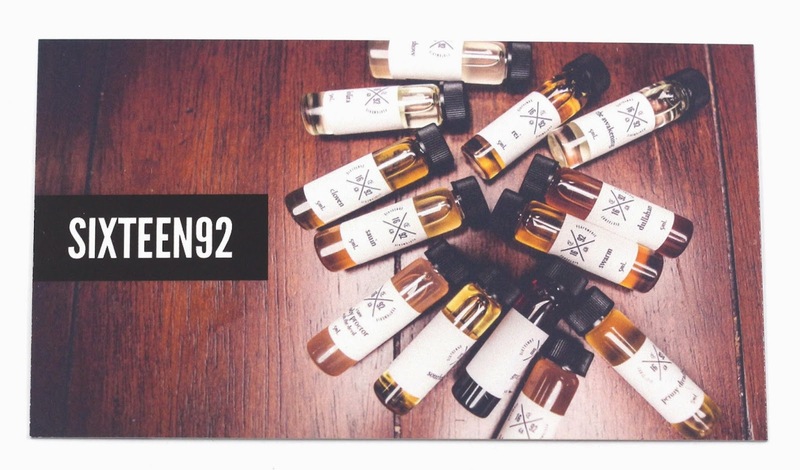 Have you tried any of the Sixteen92 perfumes? What did you think? Let me know in the comments! If you'd like to check out Sixteen92, you can visit the Etsy store here. Currently the permanent scents as well as the Fall collection are available to purchase in full size vials, or in sample packs. I try not to advertise that I'm from Texas, but I am, and that's how I heard about Sixteen92. So in an effort to support my fellow Texan and get more perfume, I ordered the fall collection. 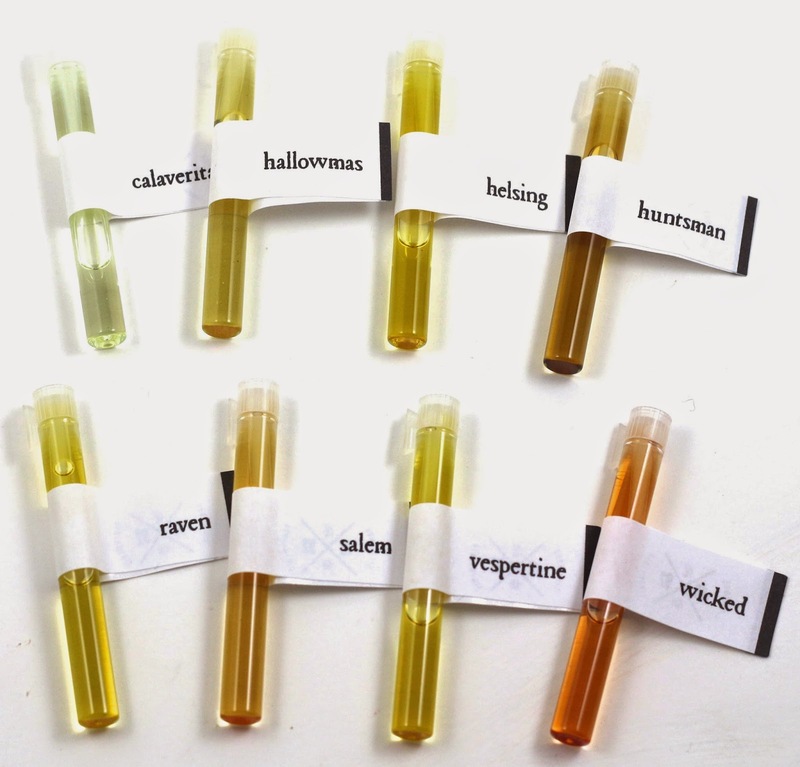 I've only tried Wicked and Salem so far, and as I'm completely new to perfume, it's interesting to read your thoughts on these. I do really like Wicked, (I apparently like sweet, subtle scents, which I didn't know, still figuring this stuff out!) Salem's a bit too clovey for my everyday use, but I enjoyed it. Thanks for sharing! Haha yeah getting into indie perfumes is a lot of fun. Especially when you can just get samples and are able to try so many to figure out which kinds of scents you like! I know, I get excited about trying each new scent! I also got samples from a few other indies to compare and contrast. You know, for science. I did a lot of bathing for Science this weekend. Science is so demanding. Ooooh how fun! Important work bathing for science is!